I’ve always had an interest in Nicaragua probably because the Sandinista revolution took place as I was getting interested in politics. That interest eventually led me to visit the country a few years ago and meet various ex FSLN (Sandinista National Liberation Front or Frente Sandinista de Liberación Nacional, depending on how good your Spanish is) combatants. 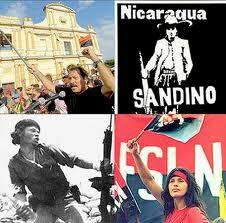 The Sandinistas were in opposition at the time (2003) and many were disillusioned with political developments and the leadership of Daniel Ortega. Others were more sanguine and recognising the changed political dynamic were more relaxed about the need for compromise and even coalition with previous enemies including former Contras. I found the debate stimulating and recognised the parallels with other countries emerging from conflict. In 2006 Ortega won the presidential election with 38% of the vote. This time, according to reports, he will receive about 60%. In large part this huge victory has been fueled by social programmes funded by Hugo Chavez and Venezuela. And if ever a country deserves a break it is Nicaragua. Everywhere you go you are struck not just by the poverty but the physical devastation that has been visited on the country by decades of both natural and man-made disasters. As you drive out of Nicaragua to the north the first thing that strikes you as you enter Honduras is the relatively new and under used motorways. Following the US governments exposure in the Iran Contra scandal it became more difficult to arm the Contra’s so the US decided to assist them in various other ways. This included building motorways to make it easier for the Contra’s to make hit and run attacks inside Nicaragua and escape back to US funded bases in Honduras. The motorways literally stop right at the border. So while Ortega has transformed himself into a strange mix of popular socialism and christianity there is no doubt he is part of a broader left movement which seems to be taking power, or at least enjoying increased popularity, across Latin America. Nicaragua is often referred to as ‘the land of the poets’ and the first Sandinista government was often called a government of poets due to the large number within their cabinet and military command, including Ortega himself. One such poet was Ernesto Cardenal who wrote the following poem for another poet, his nephew Ernesto Castillo, who paid the ultimate sacrifice for the revolution. A reminder of the price paid over several generations for the right to elect their own government without outside interference or impediment. Cardenal, a priest, was the first Minister of Culture following the revolution in 1979. His nephew, Castillo, was killed in action on September 9th 1978.
like someone speaking about a beautiful girl. A FREE COUNTRY OR DEATH! Poet you fell aged 20. Incidentally I don’t like Salman Rushdie but the only book of his I do recommend is The Jaguar Smile about the Sandinistas in their previous, revolutionary incarnation. 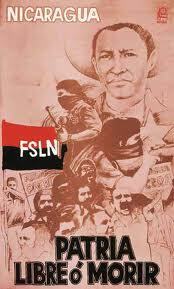 The politics, and some of the personalities, have changed but it’s still worth a read and the FSLN are still worth our solidarity.